We discussed Dr. Roy Spencer’s post More on Trenberth’s Missing Heat in my recent post and in the cross post at WattsUpWithThat. We provide updated estimates of the change of ocean heat content and the thermosteric component of sea level change of the 0–700 and 0–2000 m layers of the World Ocean for 1955–2010. Our estimates are based on historical data not previously available, additional modern data, and bathythermograph data corrected for instrumental biases. We have also used Argo data corrected by the Argo DAC if available and used uncorrected Argo data if no corrections were available at the time we downloaded the Argo data. The heat content of the World Ocean for the 0–2000 m layer increased by 24.0 ± 1.9 × 1022 J (±2S.E.) 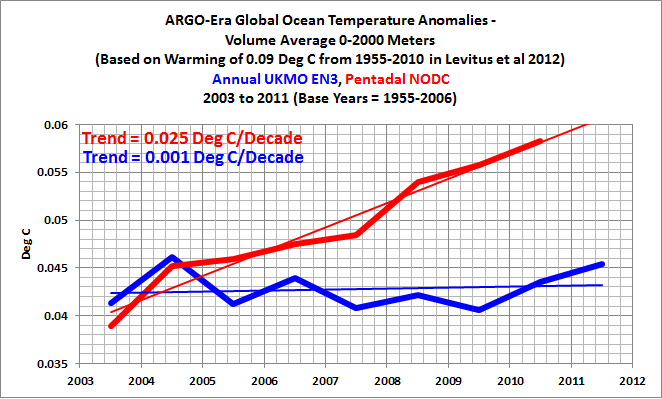 corresponding to a rate of 0.39 W m−2 (per unit area of the World Ocean) and a volume mean warming of 0.09°C. Figure 1 is the same graph I presented in the introduction of More on Trenberth’s Missing Heat. Except in this graph I’ve scaled the data in deg C so that it creates the 0.09 deg C warming of the global oceans to depths of 2000 meters from 1955 to 2010 in the NODC data. 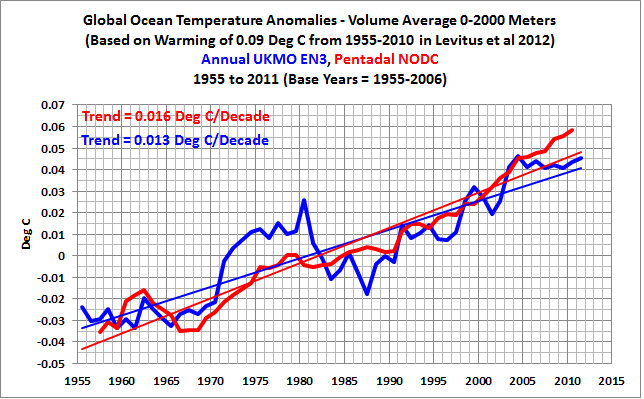 As a reminder, the “unadjusted” ocean heat content data is represented by the UKMO EN3 data, and the corrected—tweaked, adjusted, modified, whatever—ocean heat content data is represented by the NODC data. Regardless of whether you find the unadjusted or adjusted data to be the more reasonable dataset, we’re still talking of a warming of about 0.09 deg C over a 55-year period. Keep in mind, the global oceans cover a surface area of about 361 million square kilometers and the data is supposed to represent the average temperature of the oceans to depths up to 2 kilometers. Now consider how few temperature samples there are at depths of 1500 meters before 2003/04 (Refer to gif animation of temperature sample maps here). 2003/04 is when the ARGO floats began to have reasonably complete coverage of the global oceans. It’s very difficult to find the dataset credible. A warming of 0.09 deg C in 55 years equals a linear trend of approximately 0.016 deg C per decade. That’s sixteen one thousandths of a deg C per decade. Even during the ARGO era, the data has to be modified in order for it to come close to matching the warming trends simulated by climate models. I’ve shortened the term of the data in Figure 2 to the ARGO era (the period of 2003 through 2011) to give you an idea of just how small those corrections are in deg C. I’ve also included the linear trend lines for the sake of discussion. Also note that the larger annual changes in the two datasets are on the order of 0.005 to 0.006 deg C.
Most of the warming occurred in the top 700 meters. But the warming at those depths has flattened in recent years. The heat content of the World Ocean for the 0–700 m layer increased by 16.7 ± 1.6 × 1022 J corresponding to a rate of 0.27 W m−2(per unit area of the World Ocean) and a volume mean warming of 0.18°C. The depths of 0-2000 meters warmed 0.09 deg C from 1955 to 2010, but the warming of the top 700 meters was twice that amount. That means the warming of the depths of 700 to 2000 meters, where the warming is said to continue, was miniscule in terms of deg C.
In their attempts to overcome the flattening of surface temperatures trends, the alarmist community—SkepticalScience and Climate Progress in particular—have been very active recently with their reports about the continued warming of the global oceans. The most recent is Joe Romm’s April 16th post Reuters Ignores Its Own Accurate Reporting On Rapid Warming Of Oceans. If the alarmist community and the mainstream media presented the ocean warming to depths of 2000 meters in terms people understood (deg C) instead of the units meant to alarm (10^22 Joules), would the believers in manmade global warming find the ocean heat content data credible? Some would. Others wouldn’t. It really strains believability. ARGO floats were introduced to allow researchers to sample the temperature and salinity of the global oceans to depth. According to the testimony of Raymond Schmitt when the ARGO program was looking for US funding, ARGO floats would permit scientists to “begin to understand this largest component of the global water cycle.” (Refer to the Woods Hole Oceanographic Institution webpage.) But can they realistically be used to find missing heat that’s supposed to be associated with human-induced global warming? Or are certain members of the climate science community still grasping at straws in efforts to keep their taxpayer-funded research afloat? This entry was posted in CAGW Proponent Arguments, Ocean Heat Content Problems. Bookmark the permalink. Interesting animation of the pre-argo data. I’ve heard it claimed that despite the poor coverage per-argo the ocean temperature/heat content is still well known due to mixing. If true I’m not sure we bothered with argo but for the sake of argument lets make that a testable hypothesis. It would be interesting to take the modern argo data and use it to run a series of monty carlo simulations specially similar to the historical data. It would be interesting to see what kind of range of temperatures would result as that should give us a good estimate of that portion of the error component. Oops, make that “spatially similar” not “specially similar”. One of the people saying the heat is going into the oceans is Victoria University Associate Professor of Physical Geography James Renwick who is co-authoring the final chapter ‘Climate Phenomena and their Relevance for Future Regional Climate Change’. (11′24″). There was no mention that IPCC AR5 is already in the public domain and has been widely commented on. So the “well mixed” doesn’t exist for the oceans, and because of the sparseness of even the ARGO buoys, any change of a few hundredths of a °C should be taken with a grain of salt, the more for the pre-ARGO era, where only the main ships lanes had some more coverage.